The PC version of Need for Speed was delayed last year to the spring of this year, and we haven't heard a whole lot about it since. But today Ghost Games announced that it will arrive on Origin on March 15, sporting upgrades and new features including unlocked frame rates, support for 4K resolution, and manual transmissions. That last bit, about the manual gearboxes, is interesting because the console versions of the game did not include them when they were released last November. (They're getting manual transmissions too, by the way, in a future update.) The exclusion makes sense in a way, since technology has far surpassed human ability when it comes to shifting gears, but players apparently wanted it, and so now they're getting it. The PC version of the game will support “a selection of wheels from Logitech, Thrustmaster, and Fanatec,” and of course will incorporate all the various fixes and tweaks that have been made since the console versions came out. The Icons and Legends updates will also be built in, while the Showcase update, which released for consoles on February 3, will come to the PC version shortly after it goes live. The one thing it's lacking, unfortunately, is a proper cockpit view, which to my mind is an even more glaring omission than manual gearboxes. I get that you can't see your sleek machine from behind the wheel, but if the intent is to offer something approaching a realistic driving experience, then you really need to let people actually get inside the car. So says I, anyway. 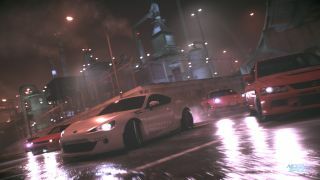 Finally, Need for Speed on the PC will be available five days early—that's March 10—to members of Origin Access, which offers subscription-based access to various EA games for $5/£4 per month. Find out more from Origin.